If your bicycle's feeling a little dull these days, then give it some personality! Using the crafty ideas below, you can transform your two-wheeler in a unique work of mobile art that will have everyone jealous. 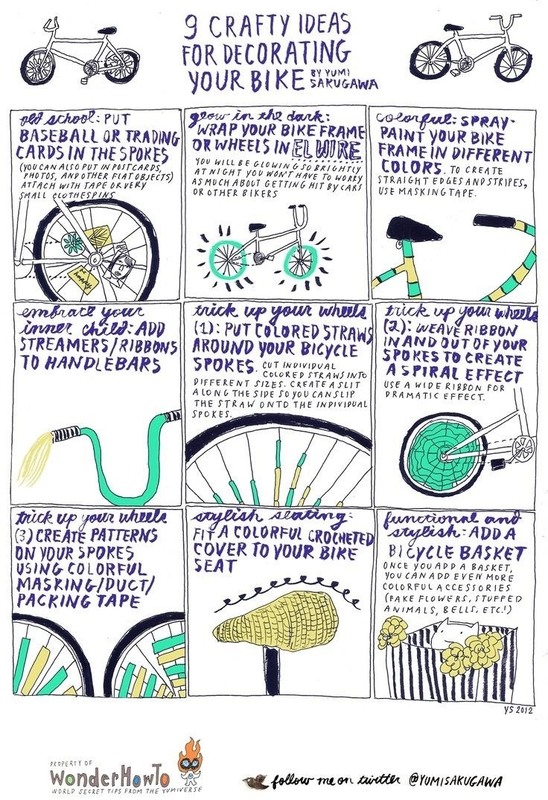 You can simply add some colorful postcards between the spokes of your wheels or, if you are up for a more labor-intensive project, can wrap your bike frame in EL wire or even crochet yourself a cushy one-of-a-kind bike seat. When you're rolling around town in your newly customized ride, just remember to wear your helmet—which you can also decorate! This can save my life from São Paulo's bus drivers!!! You should totally do it.. and take pictures if you do!